A GIANT 50-storey circular block of flats, known as the Tower and looking like a huge AA battery, sits on the Thames South Bank at Vauxhall. It has become a symbol of the madness of capitalism in advanced decay after the Guardian newspaper last week revealed that more than 60 per cent of the 214 luxury apartments in it are owned by foreigners, bought as investments and not to live in. 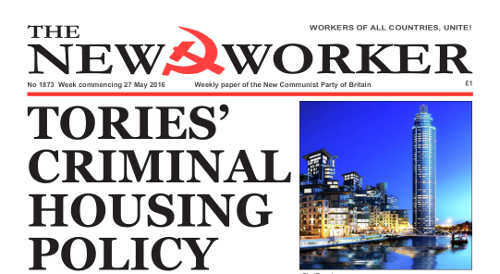 Around a quarter of the flats in it are owned by offshore tax-haven companies. Meanwhile Londoners are increasingly being evicted from their more humble homes for being unable the pay the soaring rents that rise from day-to-day as house prices increase. The flats in the Tower sell for up to £51 million but average at £2.2 million. HE EUROPEAN Union (EU) received a relentless battering last week at a packed meeting at Friends House, central London organised by Leave.eu, also known as “Lexit”. Speakers from Britain, Ireland, Greece and Catalonia condemned the EU as a project promoting exploitation, war and racism. ANTI-FASCISTS throughout Europe breathed a collective sigh of relief on Monday when they heard that the far-right Freedom Party had lost the final round of the Austrian presidential election. But it was a close-run race that was only settled with the count of postal votes. Norbert Hofer, the leader of the Freedom Party (FPO), was pipped at the post by Alexander Van der Bellen, the former leader of the Green Party standing as an independent, who won by just a margin of 0.6 per cent of the vote.